Much has been made of Multichoice's new DSTV XtraView offering. The claims of being able to link current decoders to the new HD PVR as well as each other, essentially allowing subscribers to have multiple viewing options making for interesting water cooler conversation. However, since the original press release and impressive array of graphics showing the various configuration options took pride of place, Multichoice have quietly amended their XtraView webpage. The original promise of being able to link the new HD PVR with the previous, entry level 1110 decoder has suddenly been pulled. This option is now only going to be available 'by the end of the year' according to dstv.com. For someone who was looking forward to seperating 'feeds' to different rooms in the house, only to find out (with the approved installer) once installed that the service is no longer possible until some time before the end of the year, it's a huge dissappointment. A further aggravation is that the equipment comes with no user guides or manuals. Very frustrating for a newbie! To end on a more positive note. 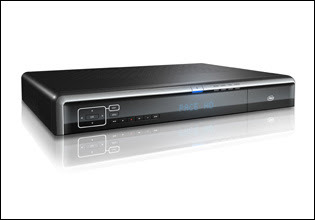 The HD PVR only offers one viewable output (hence the need for the XtraView option) however it has two recordable 'channels.' This allows you to browse through the programme listing and with 1-click, select the programmes you wish to record. The beauty being that should there be two programmes at the same time or overlapping in any way, this is no longer an issue ... all while watching a third channel. Now please click on a banner ad, it goes to the HD TV fund!